Land and Sky. Conkling Gallery. Minnesota State University. Solo Exhibition. Feb-March 2019. INFO/FLOE, Finding A Pace, Sensing A Place. Two-person show. Hermes Gallery. Lindsay Dobbin and Josh WInkler. Curated by Michael McCormack. Halifax, Nova Scotia. March 2019. 2019 Artist Initiative Visual Artist Grant from the The Minnesota State Arts Board. Grant will provide 10K in funding for the creation of new work about forests of northern Minnesota. Bradley International Print and Drawing Exhibition. Bradely University, Peoria, IL. March 2019. Fish Creek, WI. Midwest Made: Contemporary Print Invitational. Jan 2019. Fish Creek, WI. Natural and Manufactured Artist Residency. Klondike Institute of Art & Culture. July 2018. I was selected with one other artist (Lindsay Dobbin - http://www.lindsaydobbin.com/) and a curator/artist (Michael McCormack - http://michaeldmccormack.com) for this 6-week residency in Dawson City, an old mining town in the Yukon Territory of Canada. This six week residency will culminate with an exhibition in KAIC's ODD Gallery. Laura Corcoran and Josh Winkler. Two person show at the Waseca Art Center - Laura Corcoran and Josh Winkler. June 2018. Okanagan Print Triennial, An International Printmaking Exhibition. Three works selected for this exhibition in Kelowna British Columbia, CA. Altered Nature, a printmaking exhibition curated by Viviane Le Courtois in conjunction with Mo’ Print Denver. Processus Gallery. Denver, CO. The Boston Printmakers 2017 North American Print Biennial. The Lunder Arts Center, at Lesley University College of Arts and Design, Cambridge, MA. Jan. 27th - March 4th. International Print Center New York, New Prints 2018/Winter. New York, NY. Full Court Press, North American Juried Print Competition. Texas A&M University. Corpus Christi, TX. "In Memoriam" Permenant public sculpture at Marquette Park. Gary, IN. Calumet Artist Residency. June 2017. In June, I was an artist in residence for two weeks at the Calumet Artist Residency in Gary, IN. The location of this residency allows artists to explore the unique ecosystem of the Indiana Dunes National Lakeshore in contrast to the complicated social/political history of the industrial city of Gary Indiana. "Johnson Legacy Exhibition". Gordy’s Fine Art. Muncie, IN. April, 2017. Greater Minnesota Artists Showcase’ group exhibition at the State Arts Board offices. St. Paul, MN. April 2017. "Currency." Janet Turner Print Museum 11th National Print Competition and Exhibition. Jan 30th - March 4th 2017. Carnegie Art Center Member's Exhibition. Saturday, Dec 3rd, Mankato, MN. Visiting Artist. Ball State University. Muncie, IN Septmeber 21st - 23rd. Art and Conservation Panel. Artists Critiques of Socio-Ecological Relationships. 22nd International Symposium on Society and Resource Management. Houghton, MI. June 2016. Solo Exhibtion at Cross Country. Calumet, Michigan. June 2016. Cut Climb Conquer, American Landscape Narratives. Yukon Art Center. Whitehorse, Yukon. Canada. March 10th - May 28th. 2016 Artist Initiative Visual Artist Grant from the The Minnesota State Arts Board. Grant will provide 10K in funding for the creation of concrete folk scluptures to promote awareness of the growing emerald ash borer infestation in Minesota. Solo Exhibition at the MacCrostie Art Center. Grand Rapids, MN. Summer 2015. Solo Exhibition at Indiana University Northwest. Gary, IN. Summer 2015. Sphere of Existence Exchange Portfolio Exhibition at the James Ford Bell Library. University of Minnesota. April-July 2015. Bristlecone Pine Project. Faculty Research Grant. Minnesota State University, Mankato. A Graphite Rubbing and the First Felled Giant. Essay of images and text published in Graphic Impressions, The Newsletter of Southern Graphics International. Winter 2015 Issue. Conquering Natures Largest. Indianapolis Art Center. Indianapolis, IN. Indefinite Spaces Portfolio. West Virginia University Creative Arts Center. Morgantown, WV. RACA 3. Rural America Contemporary Art Exhibition at The St. Peter Arts Center. St. Peter, MN. 2014 Harnett Biennial of American Prints. Richmond, VA. Structure. The Printmaking Center of New Jersey. Branchburg, NJ. Ink, Press, Repeat: National Juried Exhibition. William Patterson University. Wayne, NJ. Josh Winkler & Emmy Lingscheit at the Peoria Art Guild. Peoria, IL. Zig Priede Scholarship Alumni Invitational Exhibition. University of Minnesota. Minneapolis, MN. Animals in America. Edina Arts Center. Summer 2014. Indefinite Spaces: 2014 Portfolio Exchange. The Crossroads Gallery for Contemporary Art. South Bend, IN. Conquering Nature's Largest. Solo Exhibition at the Carnegie Art Center. Feb. 8th - 22nd. Mankato, MN. Visiting Artist Talk. Conquering Natures Largest. Augsburg College. Minneapolis, MN. 2013. MAPC Juried Exhibition. Banshee Press. Denver, Colorado. Gamut GalleryÕs 2013 Call 4 Works Exhibition. Minneapolis, MN. Road Trip: A Juried Exhibition. Hickory Museum of Art. Hickory, NC. Edinburgh Printmakers. NEW PRINTS 2013 selections. Sept 21st - Nov. 2nd 2013. Solo Exhibition at Wonder Fair - Conquering Natures Largests. May 31st to June 23rd. Lawrence, Kansas. Visiting Artist Lecture. Conquering Natures Largest. University of Kansas. Lawrence, KS. 34th Bradley International Print and Drawing Exhibition. Bradley University. Peoria, IL. International Print Center New York. New Prints 2013/Winter. January 18 - March 9, 2013 New York, NY. Contemporary Printmaking Invitational Exhibition at the 801Gallery. Minneapolis Minnesota. (January 2013). Wonder Fair Print Invitational Jurors Award, AKA, Solo exhibition at Wonder fair -- Spring 2013! Lawrence, Kansas. Panel discussion. 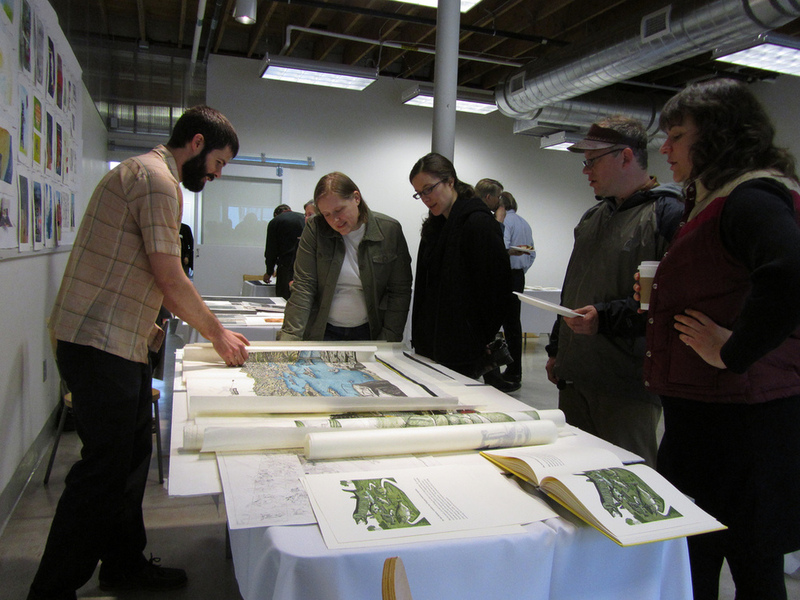 "Craft and Collaboration: Printmaking Outside Academia." Mirka Hokkanen, Stephanie Smith, Josh Winkler. MAPC, Fall 2012. Wonder Fair Print Invitational. Lawrence, Kansas. Emerging Perspectives. Marshall J. Gardener Center for the Arts. Gary, Indiana. "Secret Knots Gallery Interview The Fiddleback an independent, online arts & literature magazine. "Shelf Show" write up in The Fiddleback an independent, online arts & literature magazine. American Impressions 2012: Juried Printmaking and Book Art Exhibition. William Patterson University. Wayne, New Jersey.